According to a Harvard study, and based on our experience, more than 75% of change processes fail for largely two reasons: 1) The workforce that must live with the changes doesn’t own the process of change; and 2) Leadership loses interest or changes direction. Over 30 years, we have watched companies restructure, centralize, decentralize, outsource, change out their leadership, implement new technologies, or redesign business processes, and fail for these reasons. In working with our clients, we took a different approach. We started the change process from Culture-First, by building strong, trust-based relationships first, before tackling the process, technical, or structural change. We have an 85% plus success rate. We learned that people take care of what they own, and that if they own the change process, it will succeed. Ownership is a central principle of The Collaborative Method℠. To meet our clients’ needs, we developed a full suite of services that enable companies to create sustainable collaborative leadership cultures. What differentiates The Marshall Group from other consulting organizations is our Culture-First, award-winning methodology, tools, and processes. 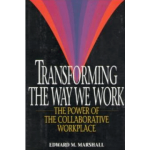 To become collaborative in your work-space, organizational change processes need to be collaborative themselves. 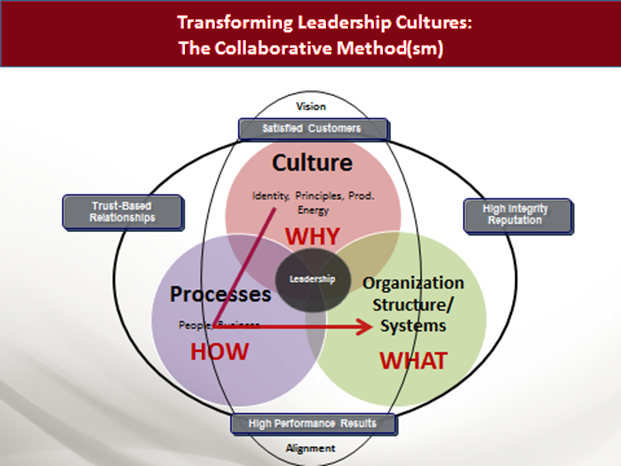 Leaders need to learn and practice collaborative behaviors and skills. Teams, whether virtual or in person, need to learn new ways of working, with collaborative Operating Agreements and governance. 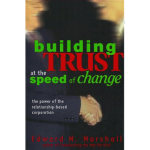 Culture-First: Organizations get optimal results when they invest in creating a trust-based culture first. This is done by giving the workforce ownership in the change process, and creating a collaborative way of working–or a new operating system for how work gets done. Trust, Not Fear: In order for the workforce to realize its full potential, to be innovative, and to optimally add to the bottom line, there needs to be a culture of trust rather than fear. Collaborative cultures engage the productive energy of the workforce, and enable them to innovate, learn, and grow. Leadership is Situational: Leadership today is based less on one’s title and more on one’s credibility, ability to engage others, and the ability to facilitate, influence, and collaborate with others. Workforce Ownership: People take care of what they own. They don’t wash rented cars. If the workforce owns the company’s vision, mission, values, and strategy, they’ll take care of it.